Today we introduce Global Food Gossip: a new monthly food column by Joanna Masters-Maggs, who was our guest in October 2011 with a two-part post about her culinary observations in Provence. Today, she takes us to Rio for her youngest son’s favourite dessert, Brigadeiros — a dish without which no Brazilian child’s party is complete. “Is there something you want to tell me about Sergio?” my husband teased, in reference to our Brazilian gardener. Our son Patrick [pictured] had just been born in Rio de Janeiro. Nine years later Patrickzinho — little Patrick — can still pass as a Brazilian. Not only are his eyes as dark as his pupils and his skin the type that tans successfully, but he has the open friendliness typical of the people we came to know and love. Patrick is a Carioca, the name given to those born in Rio. He wears the name with pride. More than once have I had to dissuade his friends’ parents that Patrick is not half Brazilian, he just feels it. That feeling has curled itself in and around him like a particularly persistent Virginia creeper. Patrick’s inner Carioca is why I have spent the morning in the kitchen, surrounded by empty cans of condensed milk, chocolate powder and mini-cake papers. I am making brigadeiros. Brigadeiros are simple truffle-like chocolates as integral to children’s parties as bikinis are to Copacabana Beach. Forgo the birthday clown if you must, but the brigadeiros cannot be skipped. Tomorrow, Patrick’s school is throwing a farewell party for a friend who is returning to Japan. The children have been asked to bring a treat from their country of origin. Well, it’s a party, and Brazil is his country of origin, so what else is he to request from the Maggs kitchen? Over the years I have played the role of Brazilian mother more than once. I have given school presentations on Brazil, sung Brazilian songs and made countless brigadeiros – all with varying degrees of success but always with great deal of enthusiasm. The brigadeiro was so named for a chocolate loving army officer. Neither his army career nor his sweet tooth were successful enough for his actual name to be remembered. The brigadeiro, however, has gained iconic status. I have been making these chocolate treats for years, but it is only recently I perfected the technique. Brazilians insist they are very easy to make, but mine always tended to be a little flat. Then, on moving to Saudi Arabia, I discovered my beautiful and charming neighbor, Yamara, was a Brazilian. An afternoon in the kitchen making a countless number of these sticky balls for yet another “My Country” presentation, and I’ve never looked back. The problem was that my consistency was too soft and I had to be braver about cooking the mixture a little longer. My little chocolate balls now have the correct mixture of stickiness and shape, but never a toffee-like chewiness. So, it is Yamara’s instructions I am sharing with you. I hope you enjoy them as much as Patrick’s class did. 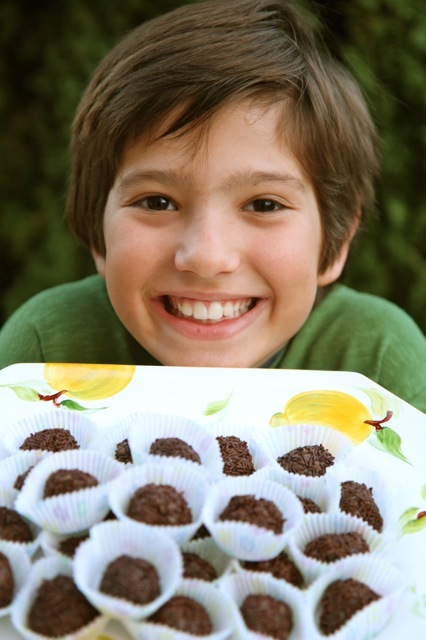 Brigadeiro-making is a fun project for all ages and now that Patrick is making his own, I pass the wooden spoon on to you. Put over a gentle flame and heat until the mixture begins to thicken. Don’t stop stirring. Brazilians say you must heat until “you can see the bottom of the pan”. This is when the heat gently lifts the mixture from the pan and you can make a wide “path” in the mixture with a wooden spoon. It takes about 5 minutes. Let the mixture cool until you can handle it. You will see it will firm up a little, so avoid the temptation to cook too long. If it is too firm the chocolate strands will not stick. If you have got it right you can take small teaspoons of the cooled mixture and it roll into balls between your hands. Finish by rolling the balls in chocolate strands. Cheerful mini paper baking cases add the final touch. Well, let’s be honest, you need the paper cases for authenticity. Really. Brazilians also like to make a softer version of the this mixture to make a decadent topping and filling for cakes. Just cook for a couple of minutes less so you achieve a rich pouring consistency. On a rich, soft chocolate cake and sprinkled with chocolate strands you have Brigadeiro Cake, another Brazilian staple. I defy anyone to eat two pieces and live to tell the tale. STAY TUNED for tomorrow’s author interview and a new giveaway! Personally I find brigadeiros too sweet; in fact a lot of Brazilian desserts are too sweet. However, it is certainly true that Brazilians love brigadeiros and you can’t have a party without one, whether it’s a child’s party, and adult or even a wedding. A Russian friend, who lived in Mexico for sometime, was interested in brigadeiros as a “light” alternative to the Mexican cocada, which her children love. Apparently the recipes are similar, but the cocada involves extra sugar. Who would have thought condensed milk wasn’t enough! What a great post, Joanna! I love how you’ve mixed your personal reminiscences with the story of brigadeiros. Any chance you’ll be writing about pao de quiexo? I remember when I taught English in New York that my Brazilian students would host parties and there were always lots of capirinhas and pao de quiexo. Thank you for your kind comments. Pao de quiexo! Just the suggestion brings back so many memories of the padaria where I used to buy my fresh milk. A “Proust goes to Rio” moment. I have an observation and a question. My observation is on how timely your new column is. An article by Mark Bittman, the New York Times magazine’s lead food columnist, appeared only last week proclaiming: No one is cooking anymore! And if people stop cooking, then we’ve lost the struggle against Food, Inc. Game over. Industrial agriculture has won. People who cook eat a healthier diet without giving it a thought. It’s the collapse of home cooking that led directly to the obesity epidemic. ML I am very tentative about banging the organic drum. I fear that with so many people in the world lucky to get a forkful of food, it is only the privileged who can get precious about organic. In France an organic chicken can be four times the cost of a regular chicken, and they are not large. Its a big subject, but, as a farmer’s granddaughter, I think certain sorts of chemicals protect crops. Crop failures, even in the First World, used to cause soaring prices and suffering for the poor. Of course, I understand the concerns, who doesn’t, but with a growing world population, I fear organic will increasingly be a marker between rich and poor. It is sad that fewer and fewer people cook at home, but I would hate the unwilling to be forced into the kitchen. I’m the first to admit that cooking for a family of six at the end of a tiring day, can be a long way from pleasure. On those days I too would like to stop home cooking! I’m sure fast food, from MacDonalds to Hawker Stands in Malaysia, doesn’t help at all. Neither do our sedentary lifestyles. When it comes to locally sourced, I am very interested, and feel on firmer ground. I like to buy seasonally and let what is in the local market dictate what I cook. I’ve just made some wonderful strawberry jam here in Provence. However, cooking should be fun and not too worthy. Coming from cooler climes, it is nice to play with some imported products and not limited oneself to months of seasonal and local cabbage and carrots – although I hasten to add that, well grown, they are wonderful things! I thought I would be on the firmest of all ground when I answered your question about my own cooking behaviour. However, I am having to think very hard indeed. The truth is, that when I start to learn how to make a dish that interests me, I become obsessional about authenticity. I am making it because I want it, just the way it comes! However, often being unable to find ingredients causes a morphing of the recipe over time. On all these matters, I need a large glass of wine and a long think. I’ll get back to you, but first I’m going to read the NY Times!